It’s that time of year again: San Francisco Beer Week is the stuff of hop head dreams and we’re thrilled to offer up a number of awesome events jampacked with exclusive brews, pairings, and more! We’re hosting events both here at the brewery and Anchor Public Taps, as well as across the city. Check out our list and come Raise Your Anchor with us! Join us every Friday for the release of a new, limited beer available exclusively at Anchor Public Taps. This week for a special SF Beer Week edition, we’re tapping two special brews! Come try Dank Denali, a bright and delicious session IPA. This light yet hoppy brew is made with pale and Pilsen malt and a chorus of harmonizing hops including Denali, Hallertau Blanc, Centennial and Ekuanot Cryo. We’ll also have Calamansi Cool, a clean lager made with Calamansi fruit for an unbeatably fresh and zesty citrus twang. At Anchor Public Taps, our family of brewers embodies Anchor’s original spirit of innovation and singularity. That’s why we started The Potrero Project; a collection of beers exclusively brewed in our pilot brewery. Be the first to try each one by joining us every Friday! Meet the brewers! Enjoy 19 Anchor beers on tap—including classic brews and limited releases—and get delicious grub from the culinary pop-up! Join us and the Pink Boots Society for a special collaboration brew day! Anchor brewer Jen Jordan and Pink Boots Society members will be brewing a Helles Bock in Public Taps’ pilot brewhouse using a special Pink Boots-curated hop blend. Proceeds from the sale of this hop blend raise funds for Pink Boots Society scholarship programs benefiting women in the beer industry. Watch the brewing magic happen while enjoying some of the 19 Anchor beers on tap! Food pop-up onsite providing delicious grub to pair with your beer. Geek out at the women-led Beer Education Station and mingle with the Pink Boots San Francisco Chapter. The collaboration beer to be released on International Women’s Day, March 8th, exclusively at Anchor Public Taps. The Pink Boots Society’s mission is to assist, inspire, and encourage women beer industry professionals to advance their careers through education. Spend Super Bowl Sunday at Anchor Public Taps and enjoy the big game on our 8k lumen laser projector and 189” screen! Pair the game with any of the 19 handcrafted beers on tap, and enjoy $4 Anchor Steam pints. We’ll have drink specials, giveaways every quarter, and tasty food from our pals at Sunset29 BBQ! For the first time ever, we’re hosting Industry Night at Anchor Public Taps. We thank the local beverage industry for their support, now let us pour you a beer! Bay Area beverage industry are invited to join us for limited and experimental brews, as well as other Anchor favorites. Food provided by onsite culinary pop-up. Required: check-in with proof of employment (paystub, business card or work ID). Anchor Public Taps will still be open to the public during the event. To celebrate SF Beer Week, head to Boulevard Café and enjoy an Anchor Brewing Tap Takeover featuring Anchor Steam Beer, Anchor Porter, Brewers’ Pale Ale, and Baykeeper IPA. $1 off Anchor beers from 3-6pm! Meet the Anchor crew and learn about the Bay Area’s oldest, iconic brewery. Round up the beer geeks in your life and head to Anchor Public Taps for a special edition of our weekly Trivia Tuesday! Anchor brewers will be leading beer trivia rounds covering everything from brewing processes, craft beer history, beer styles, and more! Trivia is free to play. Great prizes and tasty brews! 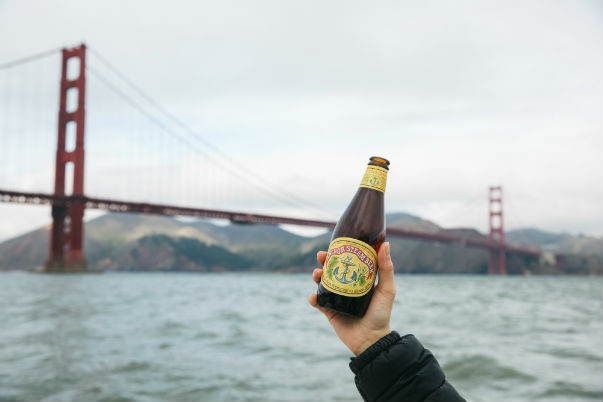 Enjoy an Anchor Brewing tap takeover featuring both classic and new beers; Anchor Steam Beer, California Lager, Brewers’ Pale Ale – Citra Blend, Baykeeper IPA, and Fog Breaker IPA. Pair our beers with some delicious Gott’s grub! The kitchen will be making its classic Anchor Steam Beer battered fish and chips. Enjoy an Anchor Brewing Tap Takeover featuring Anchor Steam Beer, Anchor Gold (AKA New England Lobster Ale) and Bay Keeper IPA. $1 off Anchor beers! Pair your Anchor beer with the lobster roll, lobster tacos, and the twin tails. Anchor giveaways and special prizes from the brewery. Come by Public Taps for free & fun DIY craft projects led by the local makers at Workshop SF. Celebrate SF Beer Week with us and Drink Beer and Make Stuff! Enjoy a few of the 19 Anchor beers on tap and let the creativity flow! No ticket or reservation required, just drop in! Join us for a beer drinking and free Valentine making party during SF Beer Week with our friends at Western Editions! Local letterpress print shop Western Editions prints unique paper goods using a 1960 Vandercook Press. Valentine’s Day is approaching! Come drink Anchor brews and make a free card for your lover, mom, gardener, or yourself with the founders of Western Editions. We’ll have envelopes and stamps too so you can mail them to long-distance lovers. Use an old school table-top press to letterpress your own card and customize it with watercolor painting. Enjoy $1 off Anchor Brewing pints, including Anchor Steam Beer, Baykeeper IPA, and Brewers’ Pale Ale- Citra Blend. Family Dog Rescue will be bringing adoptable dogs to Anchor Public Taps to celebrate SF Beer Week! Dogs will be available for adoption as well as snuggles, so come by for your dog fix! We’ll be hosting a raffle with great prizes from brewery tour tickets to Anchor swag and more! 100% of proceeds benefit Family Dog Rescue. Enjoy 19 Anchor beers on tap—including classic brews and limited releases—and get delicious grub from the culinary pop-up, Frank Grizzly’s! Family Dog Rescue is a grassroots-grown, nonprofit dog rescue organization founded in the Bay Area in 2010 to save family-friendly, homeless dogs. From the underdogs of California’s overcrowded municipal shelters to the street dogs of Mexico, Family Dog Rescue gives dogs in need a second chance. Family Dog Rescue welcomes these dogs into their San Francisco shelter and foster program, providing them with medical care, temperament analysis, spay/neuter, vaccinations and finally, a loving family of their own. Family Dog Rescue is proud to save dogs of all kinds, especially differently-abled dogs and dogs with other traditional barriers to adoption. Family Dog Rescue is 100% funded by donations, which pay for the treatment and care of over 1000 homeless dogs a year. Baykeeper IPA will be on tap and $1 for every pint sold will be donated to San Francisco Baykeeper. Meet the crew from San Francisco Baykeeper and Anchor Brewing; learn about the important work Baykeeper does to protect the Bay from pollution and how its collaborated with Anchor Brewing. Pair Baykeeper IPA with some delicious sustainable seafood dishes with a West Coast style at Pacific Catch. Join us every Friday for the release of a new, limited beer available exclusively at Anchor Public Taps! This week for a special SF Beer Week edition, we’re tapping a dark winter wheat beer brewed in collaboration with our friends at ThirstyBear Brewery and Admiral Maltings. Celebrate San Francisco Beer Week as Anchor Brewing presents a local music showcase, hosting some of the Bay’s best rising talent. The evening will feature ZOLA Music, Amen’Auset, and Johnny Hwin of Cathedrals (DJ Set)! Enjoy Anchor Brewing tap features including Anchor Steam, California Lager, and Fog Breaker IPA. Meet and mingle with the Anchor brewers, the masterminds behind these beers. Enjoy a special San Francisco Beer Week event at Pacific Catch San Mateo featuring Anchor Brewing’s Baykeeper IPA and Anchor Steam. Anchor brews are just $5 from 4-6pm and we’ll have some delicious happy hour menu items to go along with them! Meet the Anchor crew, learn about the brewery and learn about Baykeeper’s wonderful stewardship of the Bay from 3-6pm and score some giveaways from the team! Join Après Yoga for a 1-hour yoga class at Public Taps before doors open to the public. After the yoga class, connect in community over a fresh pint of Anchor’s finest with your fellow beer-loving yogis! Join us for our most anticipated event during SF Beer Week, as our brewers pull back the curtain and share Anchor’s barrel aging program during an exclusive tasting! Anchor brewers will take attendees through a very rare tasting featuring single barrel aged beers siphoned directly from the barrel in front of you. Attendees will enjoy pours from four different barrels, from dark whiskey barrel aged beers to lighter sour ales. Join us and your San Francisco Beer Week will go out with a head-bang at the best beer-filled outdoor music showdown in San Francisco! Jam to the Battle of the Bands concert, featuring some of the Bay’s best rising talent. Grab some grub from the trucks and spend the afternoon savoring Anchor Brewing’s finest classic beers and exclusive, limited releases! Attendees will enjoy pours from four different barrels, from lighter sour ales to dark whiskey barrel aged beers, then finish with a blended bottled beer. The tastings will take place at Anchor Public Taps, our pilot brewery and bar located just across the street from our iconic brewery in San Francisco’s Potrero Hill.